You’re left wondering how all of these can be right … and also wrong. Truth is the ideal length is different for every video, and determining it depends on a lot of variables. What are we trying to accomplish? Who is the audience? Why are they watching? Where are they watching? And so on. Content is going to be way more important than length in a social post, but it still matters. Think about your own experience on social media. When you’re scrolling, videos have a couple seconds to grab your attention or not. If the first 5 seconds are engaging, it won’t matter if it’s a 30-second ad or an 8-minute TED talk. But, as you’re watching, if it starts to feel a little long, you’re likely to check the clock. You might carve out a few more seconds to finish a video, but you probably won’t stick around for 5 or 10 more minutes. 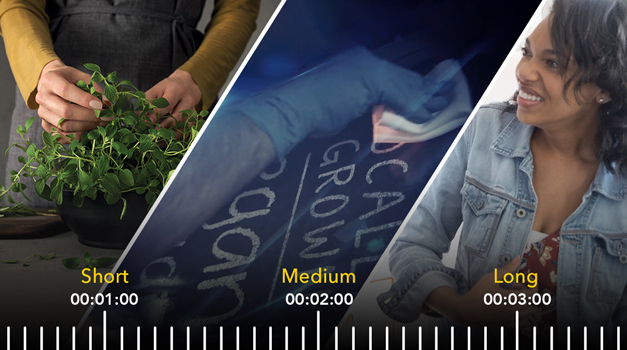 Street Level Studio’s client Blomberg wanted to drive awareness via social channels using video to spotlight key product features and benefits. Blomberg is an internationally known home appliance brand focusing on premium, compact products for urban builders. A jazz soundtrack was chosen to align with their sophisticated target audience and draw the viewer through the quick video. Watch the upbeat 30-second video here! Canon Solutions America needed a video to tease the introduction of a revolutionary new product featuring proprietary technology. Initially, the video would be created for a by-invitation-only event to highlight product benefits without revealing what the product looks like. Our team felt this was the perfect time to create a video similar to a movie trailer. After the initial event, it could be distributed across multiple platforms and continue generating buzz. Opting for a medium-length video not only afforded the client multiple opportunities to build anticipation in advance of the product release but also kept production costs low without sacrificing any relevant or intriguing content. What are you waiting for? Watch the teaser video here! At trade shows, you’re trying to create a brand island in a sea of bright lights and attention grabbers. Likewise, in a showroom, your brand is not only competing for attention with several other brands but also with POP displays and promotional deals. In these environments, a longer video with smaller segments might be the most appropriate way to speak on the brand’s behalf until a face-to-face, in-person connection can be made. Beko is a huge global home appliance brand relatively new to the US market. To promote their advanced technology and emphasis on empowering healthy family living, Beko needed an introductory video that could stand out in crowded retail environments and appliance showrooms. Effectively communicating their brand values, showcasing unique product features, and telling their story required a longer video. Driven by text animation that encourages viewers to read content while digesting visuals, the video offered a variety of ways to learn about the brand and increased the likelihood that viewers would retain the information and gain confidence in a brand they probably hadn’t heard of before coming into the store. “Meet Beko” and watch the video here! There’s no denying we’re a society of shrinking attention spans (which means we probably should have cut this blog shorter)! It’s important to use the golden rule of marketing: Keep it short and simple. Don’t show 10 minutes when 3 will do, but don’t cut to 1 minute when 6 is not only appropriate but also beneficial.¬ While it’s true what Wistia’s data says—the video length sweet spot is 2 minutes—don’t forget that content, intention, placement, and value to the audience are the real key drivers of viewer engagement. And that takes as long as it takes.